As a programmer, there are many methods that can be done according to each needs and habits. 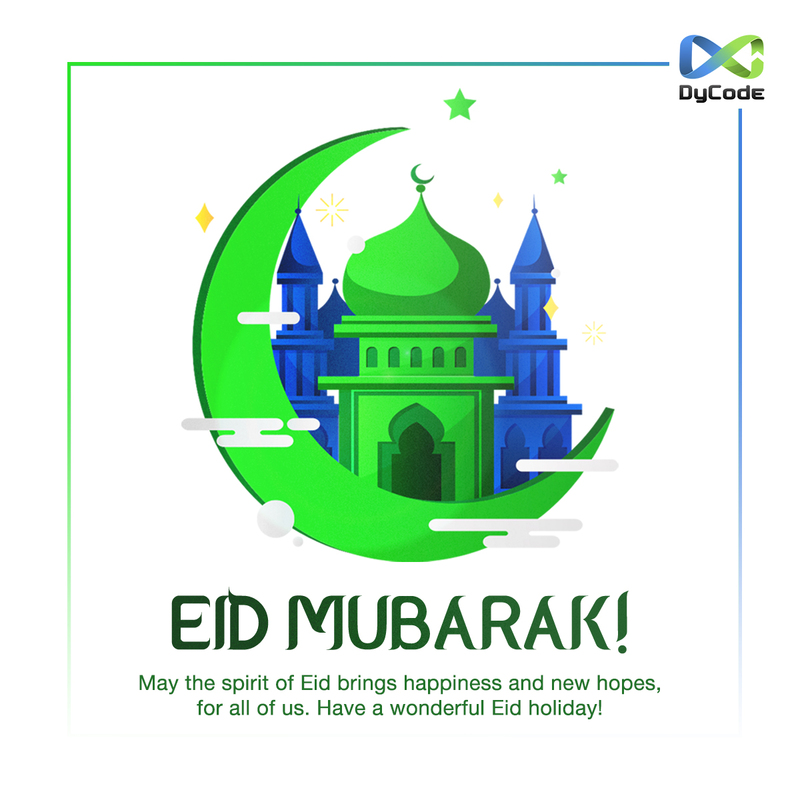 At DyCode, every programmer is expected to be able to provide the best with the skills and methods that are appropriate for them and the clients’ needs. 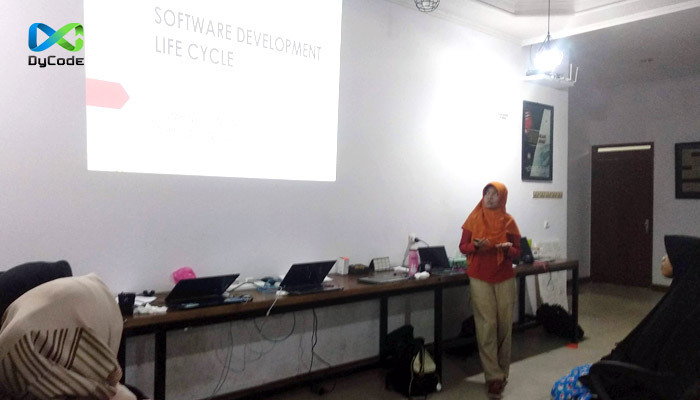 During last week’s sharing session, Rina Maylestari, System Analyst from DyCode explained the topic about Software Development Life Cycle. This time she explained about the combination of RAD and Agile. Fast development. With RAD, projects are more likely to finish on time and to the client’s satisfaction upon delivery. Prototype. In this rapid application development phase, the developer’s goal is to build something that they can demonstrate to the client. This can be a prototype that satisfies all or only a portion of requirements (as in early stage prototyping). Meanwhile, Agile SDLC model is a combination of iterative and incremental process models with focus on process adaptability and customer satisfaction by rapid delivery of working software product. Agile Methods break the product into small incremental builds. These builds are provided in iterations. Of course this method also has several disadvantages, such as the difficulty of predicting analysis, design and development. Besides that it can also raise problems in terms of architecture and design. Any method chosen by the company can certainly be adjusted to the developer’s own comfort and the nature of the company. 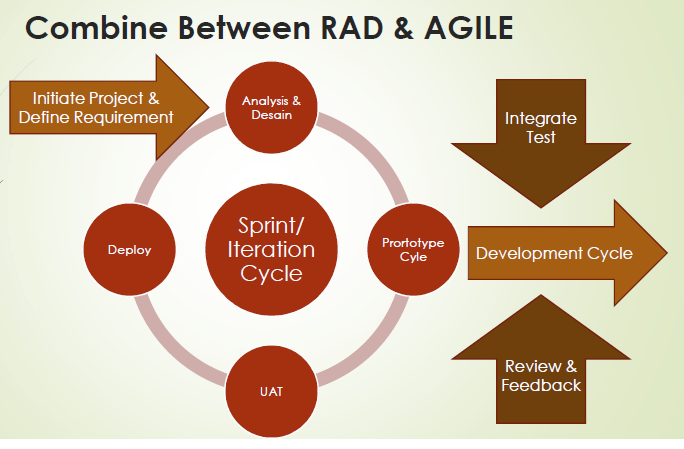 Merging between RAD and Agile can be an option, because it relates to two things. The first is the scope of the project. If the majority of the middle project and timeline are fast, then combining these two methods can be the right solution. Another factor is the size of the company which is not too large with the average resource that has similar skill levels. But still in the level of each resource could complement each other with the skills they have, the RAD and Agile methods can complement each other as well. What about your team? What method do you think is most appropriate to adopt? Let us know your opinion on the comment section! Sharing is a gesture of kindness and concern to others. By sharing knowledge, we also enrich the treasures of science. It is with this sharing spirit that DyCode holds a sharing session every Monday. But we also have a special sharing session that we call DyCode Engineering Day. 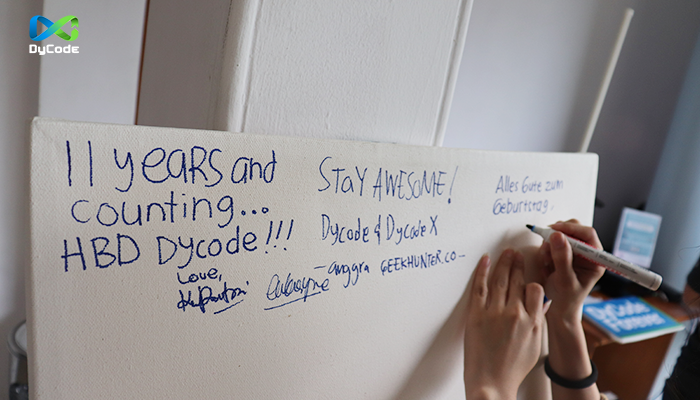 As a growing tech startup, DyCode is filled with people who are passionate about science and technology. The DyCoders – our crew – provide a lot of insights and feedback to the company, and also shaped our critical thinking. Sharing session like Engineering Day becomes the trigger for each of us to grow. Everyone observed the technological trends during past Eid holidays and shared their opinions on the latest technological developments. 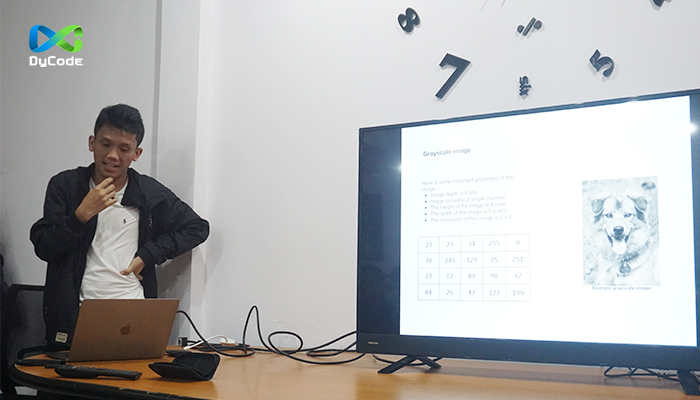 In DyCode Engineering Day this time, there were some interesting topics shared, among others, about Apple technologies in WWDC, Google I / O, Augmented Reality, etc. 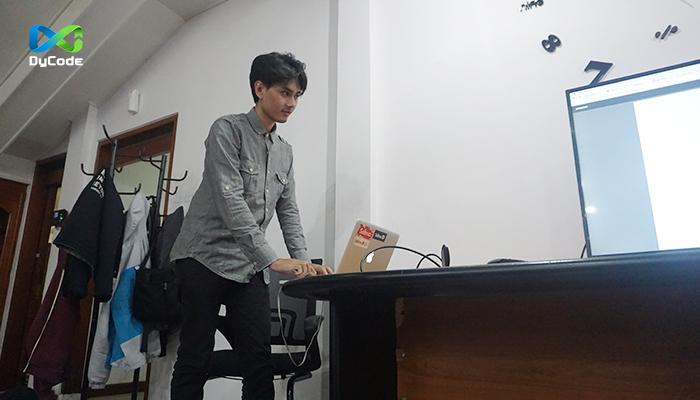 There was also Fauzan Alfi, a former DyCoders who happened to visit DyPlex after his visit to Mozilla HQ in San Francisco, USA. 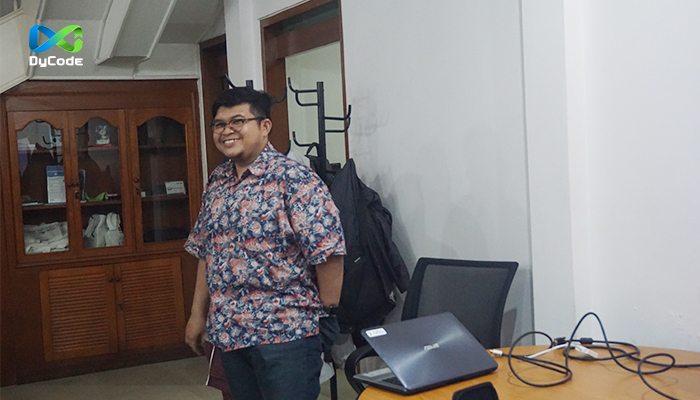 Fauzan talked about his experience of being a contributor to Mozilla Indonesia and interesting insights during his visit to Silicon Valley. If you would like to see some DyCode Engineering Day snippets on June 22 and 25, 2018, you can see in our IGTV account @dycode. 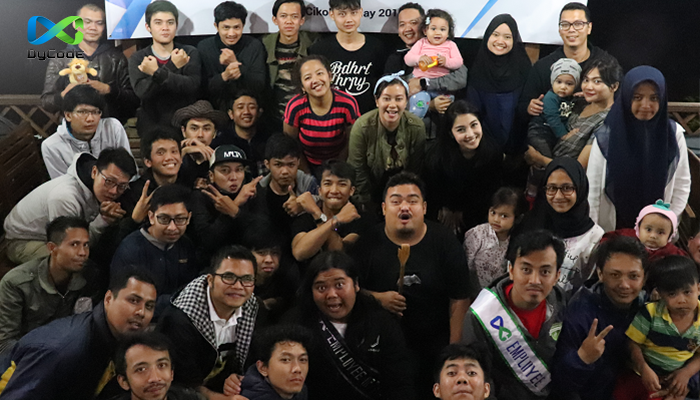 DyCoders BukBer 2018 : Breaking The Fast! In Ramadan month this year, Dycoders crew still run office activities as usual. We are still busy with various projects, the tasks from the clients, while our Muslim friends also keep the rhythm of fasting. Nothing has changed from DyCode’s daily activity, except the pantry which got very busy in the evening and various desserts every day. The tradition of breaking the fast together (buka bersama) is a tradition when Muslims end a full day of fasting with meals with friends and families, appreciating God’s blessings and sharing happiness. 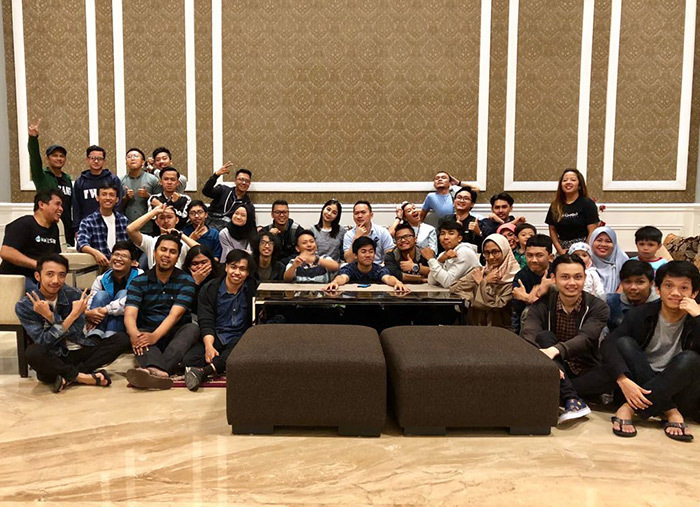 For this reason DyCode held the fast breaking event (BukBer) at Emerald Restaurant, Travello Hotel Bandung on Monday, June 11th, 2018. The event started at 17:45 when the Maghrib call to prayer as a sign of the end of fasting period. All DyCoders crew immediately took the prepared food and drinks and ate them together. 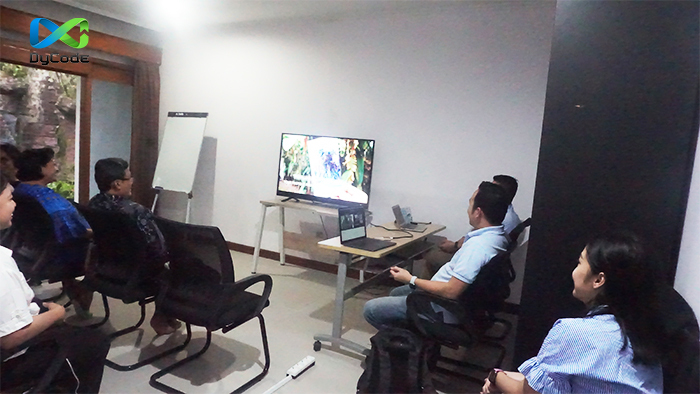 The event continued with the usual sharing session held every Monday afternoon at DyPlex. 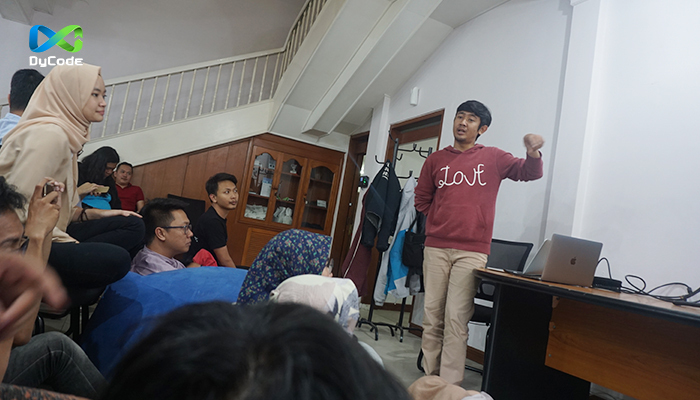 This time, the sharing session presented some interesting topics and stories from inspiring DyCoders. Hopefully the joy of BukBer will continue until Eid Al-Fitr arrives. Happy Eid Al-Fitr for Muslim friends, and have a great holiday for everyone! Years gone by, and suddenly it’s been 11 years since the first day DyCode established. We have undergone various transformations and changes. Starting from a small team in a narrow office, until now DyCode already has 30 people as Dycoders and settled in a new, larger DyPlex. 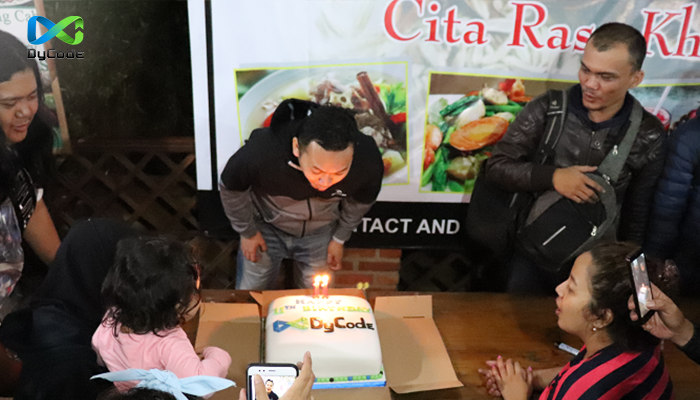 To celebrate the 11th anniversary, this year DyCode invited friends, colleagues and clients from tech startups and companies in Bandung to attend DyCode open house event. This event is also a housewarming to inaugurate the new DyPlex, where DyCode and its subsidiaries (DycodeEdu and DycodeX) now reside. Located in DyPlex’s backyard, on May 15th 2018 we gathered with the guests to enjoy the food and beverages served from afternoon to evening. We were very grateful for the presence of our investors, colleagues, and also the clients who took the time to attend this small party. Happy 11th anniversary, DyCode forever! The movement of the IT world is getting more dynamic everyday. In any part of the world, tech companies – especially startups, continue to struggle, make changes, create new things. The requirement of every tech worker’s creativity becomes higher, in line with the market demands. It is how these companies can survive: relying on the creativity and persistence of every employee. 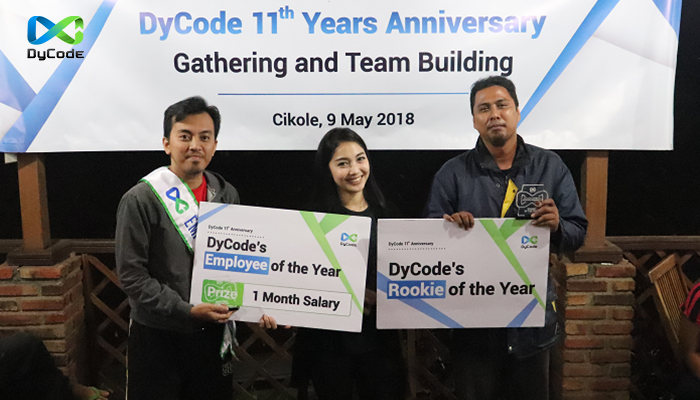 As described in the HR In Asia article on the importance of team outing in recharging human energy, creativity and motivation, DyCode recognizes the importance of togetherness and cohesiveness in our own team. That’s why we held DyCode Outing Day on Wednesday, May 9, 2018. Coinciding with DyCode’s 11th anniversary, we decided to celebrate today by having fun with the entire DyCode crew – including DycodeX and DycodeEdu. The company outing day event is actually an annual event organized by DyCode as a refreshment and to bond the whole team. 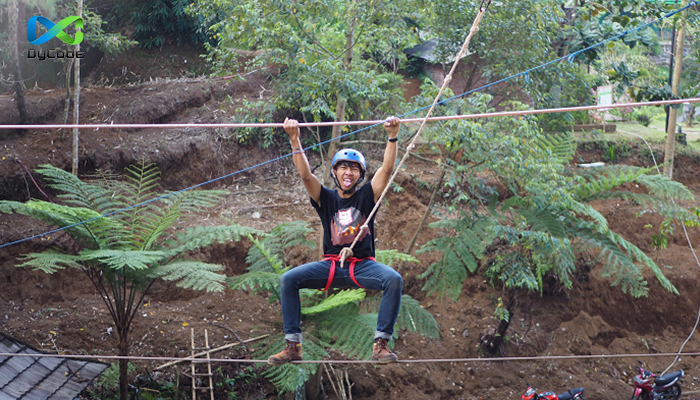 This year we decided to have fun at Wisata Grafika Cikole, Lembang, in northern Bandung. Cikole is a famous mountain forest area at the foot of Mount Tangkuban Perahu, with a cool natural air and not so far from downtown Bandung. It only took us about an hour and a half driving to get there from DyPlex. 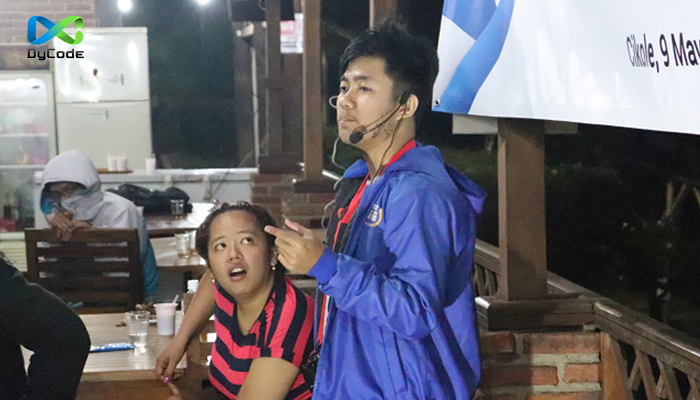 We were greeted with an Outbound team that will guide us during outbound and team-building sessions. 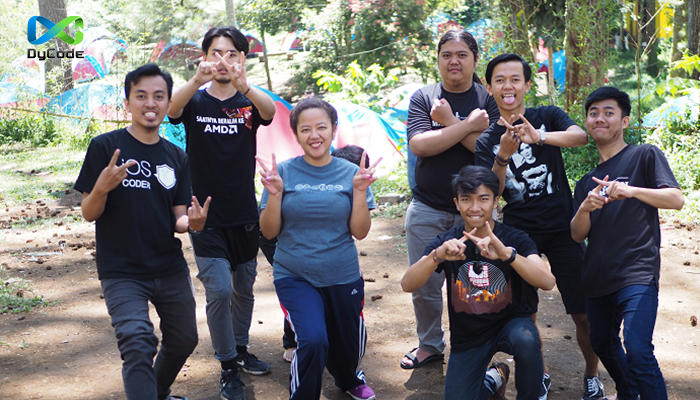 The various team-building games were very interesting and followed by the entire crew of DyCode with great enthusiasm. 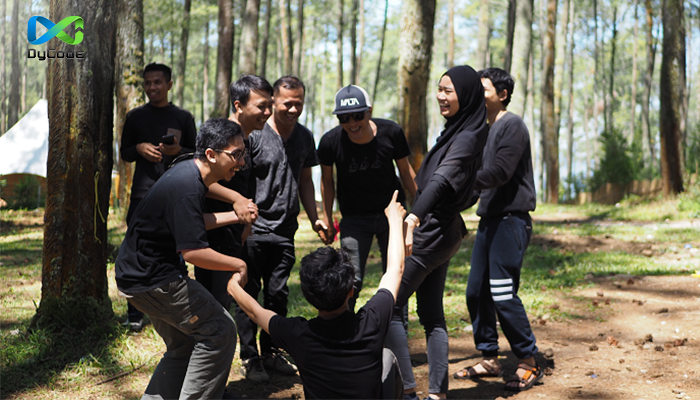 Divided into groups, each group were eager to complete the challenges with full concentration and teamwork, along with endless laughters. Unbeknownst to us, these games have cultivated a sense of togetherness and strengthened the sense of familiarity between DyCode crew. 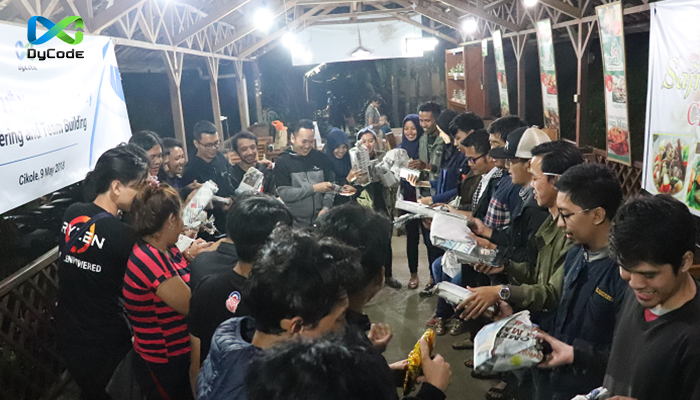 DyCode outing event that day was wrapped with dinner and sharing session at Natural Strawberry Restaurant, still in Lembang area, not far from Cikole. The DyCode crew had prepared several ideas to enliven the so-called talent shows, such as the drama skits and stand-up comedy. We also exchanged gifts to one another, and got surprised with the creativity of the gift ideas. 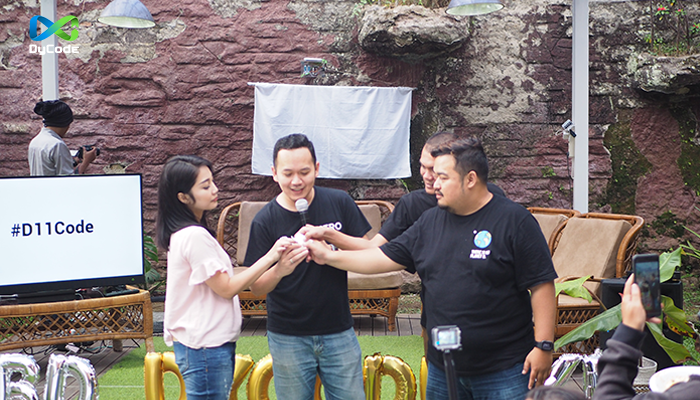 At the end of the show, our CEO Andri Yadi and COO Gina Rizka made announcements about Rookie and Best Employee Of The Year from DyCode and DycodeX. 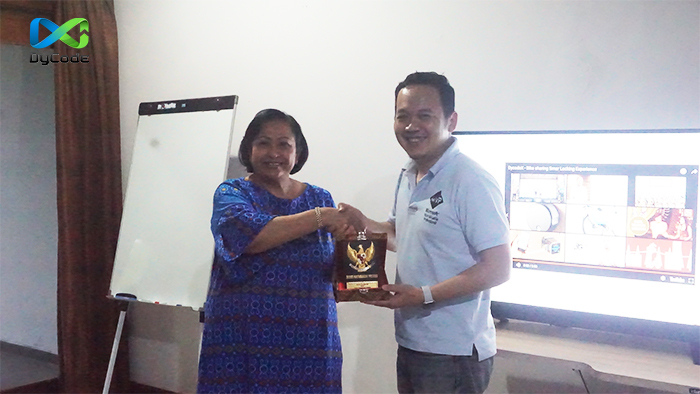 For DyCode, Rookie of The Year went to Faisal Haris from HR department. 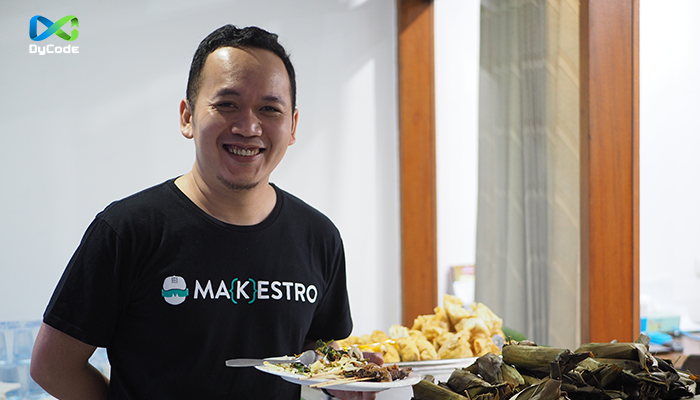 While from DycodeX, Rookie of The Year went to Indra Ginanjar, the IoT Engineer. 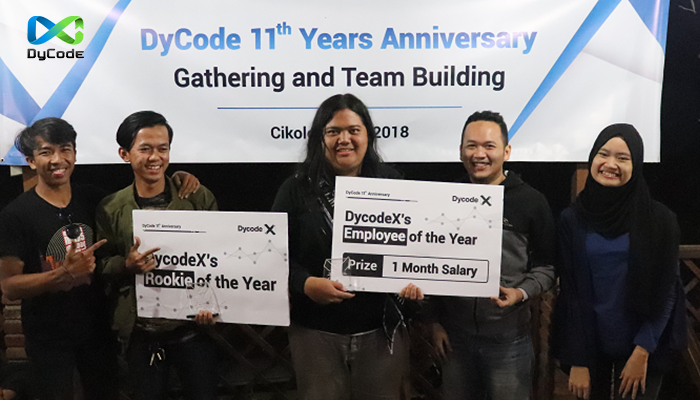 As for Employee of The Year from DyCode was held by Ari Fajrianda ‘Ryan’ Alfi the Project Manager, while DycodeX Employee Of The Year is Alwin Arrasyid, our Lead Programmer. All of them are entitled to hold the trophy and special gift from the company. Congratulations, guys! Birthday celebrations will not be complete without a candle blowing event and a piece of cake. We all wishing all the best for DyCode in this year 11th years and many years to come. happy anniversary DyCode! DyCode 11th Anniversary excitement can be seen in our social media (Facebook, Twitter and Instagram) with hashtag # D11Code. We still have another event for # D11Code, so stay tune! Established for 7 years and successfully built DycodeX, DyCode is now about to launch its new subsidiary. 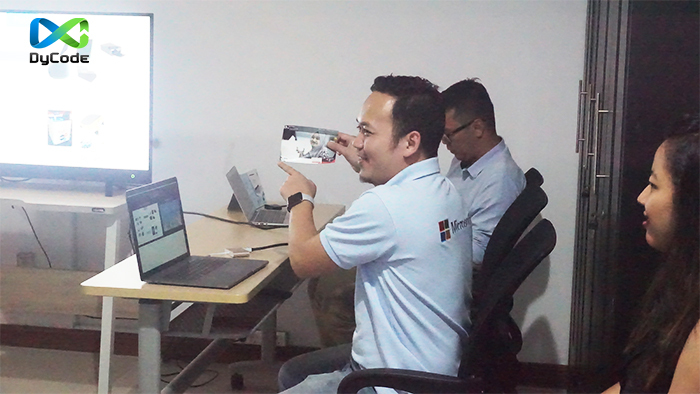 Unlike other business lines, DyCode is now focused on non-formal education to introduce technology to the young generation. 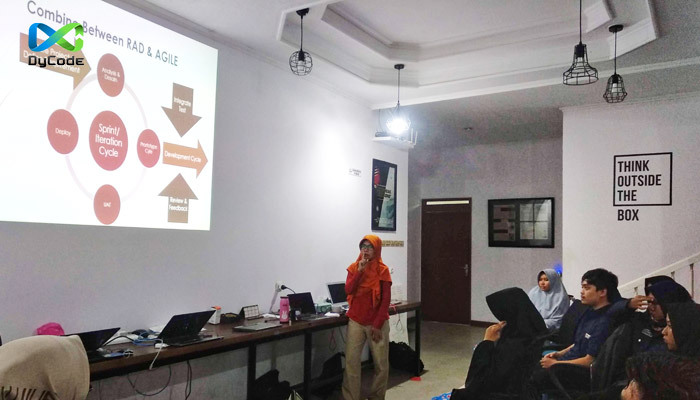 Gina Rizka, Chief Operational Officer (COO) of DyCode stated that it’s the nature of DyCode to share the knowledge. From the creative industry side, we realize there are so many demand in human resource that can not be fulfilled. Hopefully, the plan to open a new subsidiary IT education and recruitment can overcome the the needs of IT talents in creative industry companies like DyCode. The new subsidiary will not only fosters the ability of potential developers. 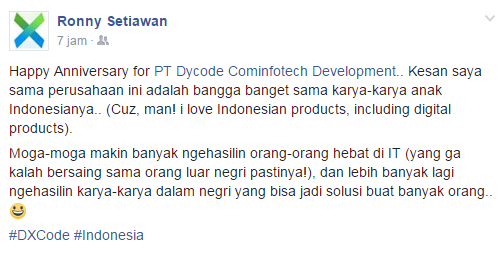 DyCode also hopes to become a distributor of creative IT talents, and furthermore, to reduce unemployment rate in Indonesia. DyCode is still considering the name of the new subsidiary. As Gina mentioned, it would be another Dy-something. So, will DyCode subsidiary be able to compete with another IT recrutment companies? Of course we are crossing our fingers and hopefully this will be the good leap in IT industry. 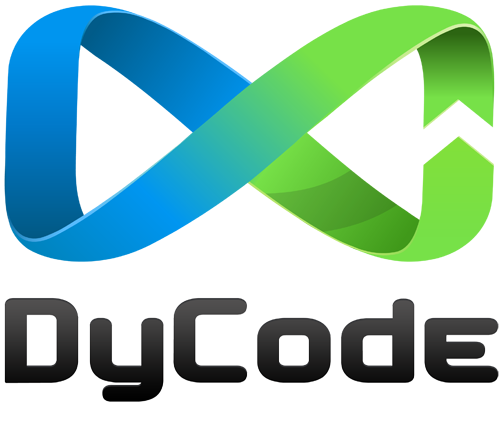 Currently, Dycode is fixing various management and business affairs of the company. Therefore, the opening of the new division is still not possible in the near future. But we are having fun with this year’s April’s Fool joke adding our friends anticipation of the new division ideas. Hopefully we will actually be able to realize this idea soon! 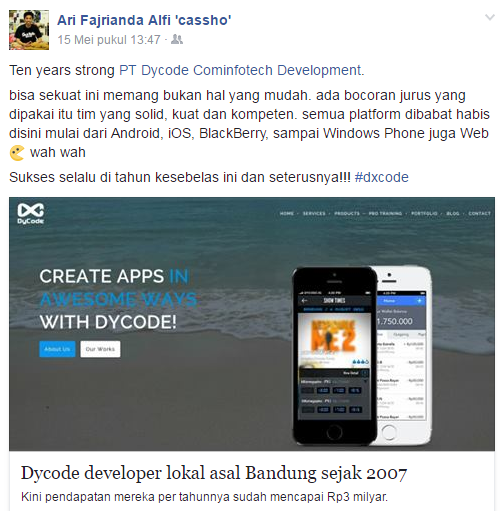 Stay tune for more news and update about DyCode in our social media and blog. Digital industry in Indonesia is currently emerging in the last ten years. 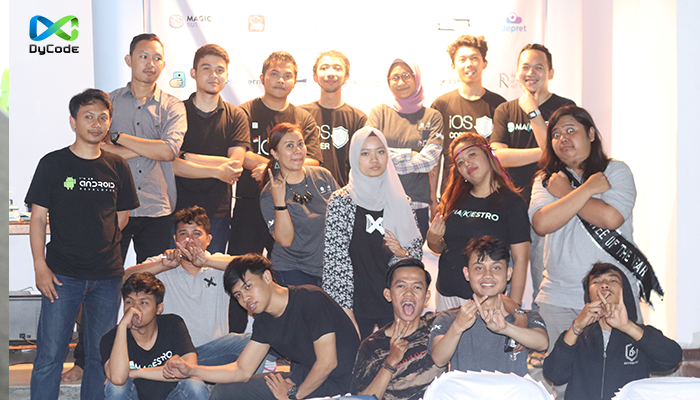 To continue to maintain the digital ecosystem in Indonesia, it will need not only the startup enthusiasts to work on the development, but also supports from the government. The government is now beginning to show a proactive interest in supporting the creative and digital industries. 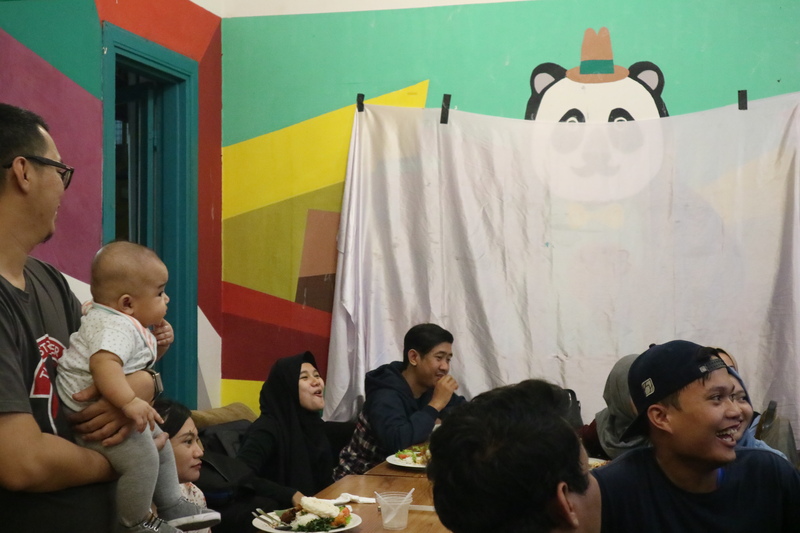 One of them is done by the Dewan Pertimbangan Presiden (Presidential Advisory Council – Watimpres) who meet face to face with the startup activists in Bandung. 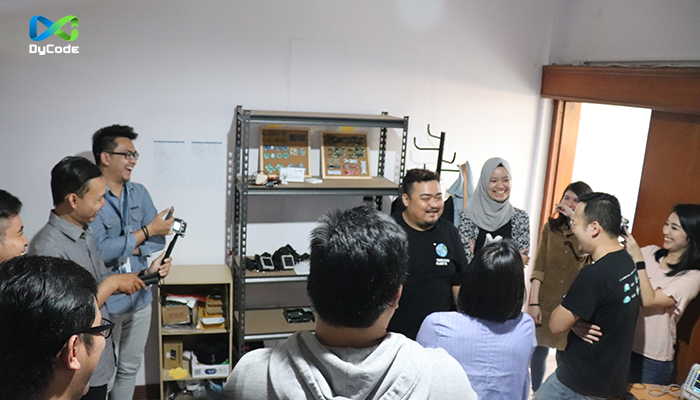 On March 22, 2018, Dewan Pertimbangan Presiden Indonesia visited some startup offices in Bandung. This visit is a part of the government work visit to West Java, to assess the growth of digital and creative economy in the province. 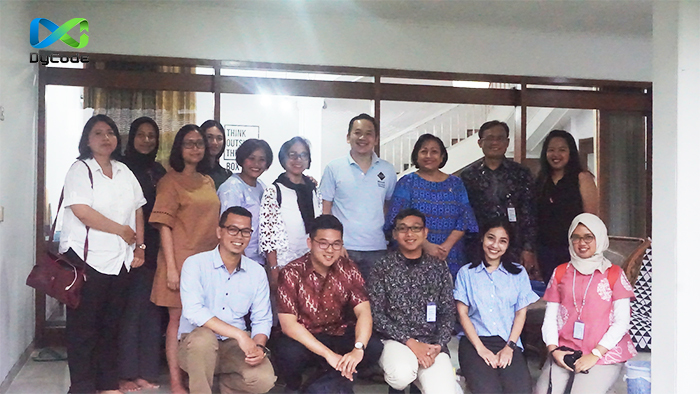 Watimpres visited a few startups in Bandung such as Bandung Digital Valley (BDV), Agate Studio, Octagon, and Dycode. 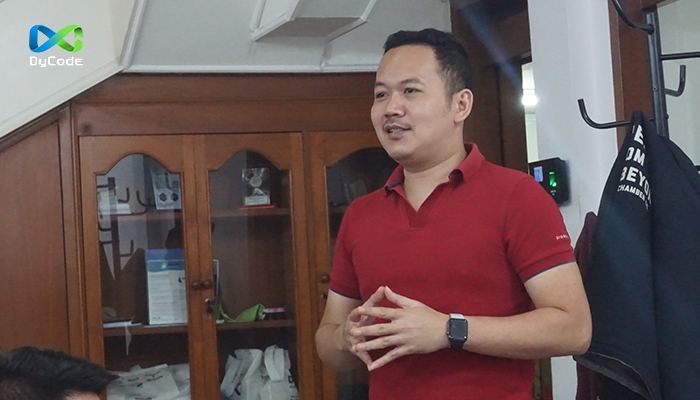 In DyPlex, Prof. Dr. Sri Adiningsih, chairman of the Presidential Advisory Council and CEO of Dycode, Andri Yadi shared about Dycode journey and how the government can support tech startups and IT industry in Indonesia. 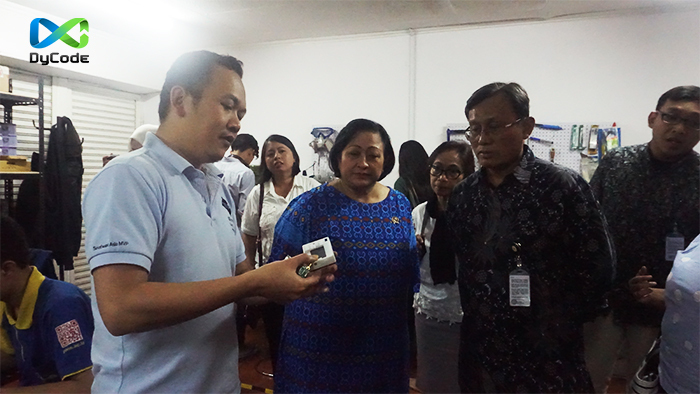 Watimpres team also visited Dycodex workshop and saw the making of our IoT products. Of course there are still some obstacles faced by startup activists, one of them regarding government policies. Therefore, Watimpres seeks to accommodate the aspirations and opinions of IT industry actors. After this working visit, it is expected that the government can filter and consider policy measures that can better support the IT industry ecosystem in the country. It’s been an honor for us, thank you for your visit! While we are trying to keep up with the fast-pacing changes in digital technology, our team also making changes for better work and experience. Our headquarter – DyPlex – is now moving into a new place. Bigger, better, and cooler – we are aiming to make everyone in Dycode is having a comfortable place to work and producing brilliant ideas. We believe a good work environment could lead us to effective works and innovative minds. Learning from our past experiences, this time we put all of our efforts to fix all the ‘bugs’ – both in our management and also in our works – in order to deliver our best for the customers. So this new DyPlex is a start to a brand new Dycode. In line with our efforts to renew ourselves, we also looking forward to new talents in the IT field. As we all know, our current technology industry requires more resources with qualified skills to be able to jump directly into the IT business and take part in a full-fledged digital world. To that end, we have set up Bootcamp for every individual who wants a career in IT and want to explore his talent deeper. We are going to select 20 candidates consist of iOS, Android, and Web developers to join 3 months course in our DyPlex. If you are fresh graduates, or a tech enthusiast who’s ready to jump-start your career, then submit your registration now!